I never knew that you could get your sewing machine to automatically stop with the needle in the fabric when you took your foot of the pedal. Earlier this year I learnt this in a Deborah Louie class I attended. When I got home I decided to see if I had this function on my MC11000. Looking at the manual I couldn’t find the information anywhere so I had a play around looking at my machine. On the main screen I noticed some images to the bottom of the screen. Looking closer I noticed a image of a needle in the raised position. I pressed on the button and the image changed to the needle being lower. 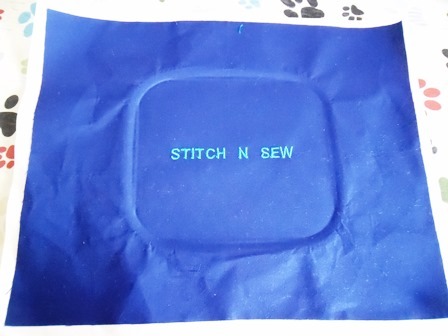 I stitched a few stitched and realised this was the automatic needle down button. Now that I have discovered this function I use it all the time. It is perfect when you have to pivot fabric as you know the needle is going to be down in the spot you want and you don’t need to place the needle down with the hand wheel or needle down button. 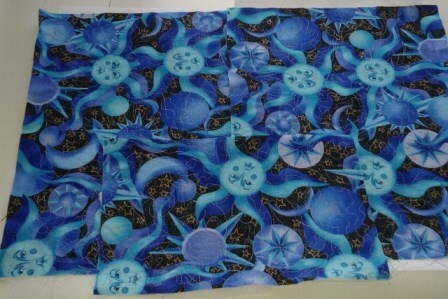 When doing free motion quilting you are able to stop and reposition your hands without the quilt moving. 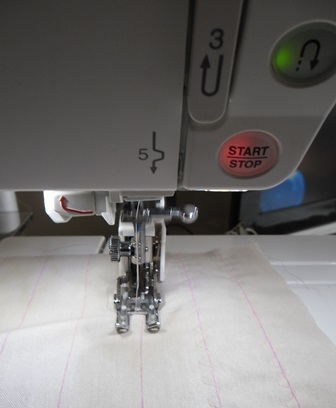 If you start stitching and have forgotten to set this function you can easily stop stitching and press the button, when you next stop stitching the needle will stop automatically down in the fabric. This is another reason why I like going to classes or group, you pick up other really handy bits of information and tips that you can use in your every day sewing. Confession I was having a lazy day yesterday…. I was sewing repetitive lines on an item yesterday. This is awful to say but I was bored holding my foot down on the pedal, yes maybe this meant I shouldn’t have actually been sewing but my gifts need to be done. On my MC 11000 machine I have the option of foot pedal free sewing by operating the machine by pressing the Start/Stop button. 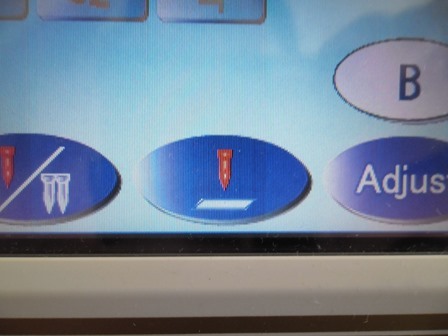 I’ve only ever pressed this button when doing machine embroidery but never during regular sewing. I decided to give it a go. The first thing I discovered is that it won’t work with the foot pedal plugged in, if you press start your prompted to disconnect the pedal if its connected. When you start sewing the first stitch or two is a bit slower than it resumes your normal speed. With what I was making it didn’t matter where my stitch lines finished. 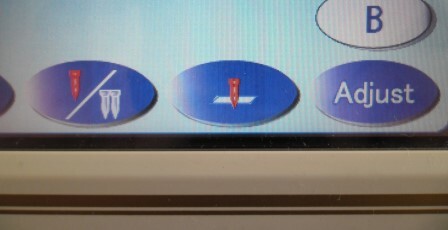 If you had to be very precise you could press stop near where you wish your stitching to end then press the needle up and down button to get to the exact spot. If your sewing with a decorative stitch when you press stop the needle position doesn’t go back to the centre to start the stitch at the beginning it remains in place so when you press start again it continues with the pattern. If your halfway through a swirl or shape it continues on doing that part of the shape even if you have shifted the fabric. With what I was making this wasn’t really an issue. I didn’t try it but I wonder if you press the back stitch button it would anchor the stitch and the needle return to the centre position like it does when you press the button during a decorative stitch with the foot pedal connected. In regular sewing I don’t see myself going pedal free very often however I think it would be really useful if you at ever couldn’t use your foot to operate the pedal. I’m lucky I operate my machine with both feet (it seems except if I’m tired) Or you could use it if having the foot pedal on the floor is dangerous due to small children or pets. Online I hear a lot stories of animals falling asleep on foot pedals and scaring the owners. It’s always good to know all the options available to you on your machine. Over the last week or so I joined a closed Facebook group with fellow embroidery machine users. They set a little challenge of “stitch up one of the inbuilt designs on your machine” I thought yep I’ve never stitched an image before but I can do that. The one I chose was this little bear design (Hoop ST Design 12) I will be honest the bobbin tension was wrong I realised this after I started that I should’ve set the bobbin dial on 2. I changed it half way but she has come out more white than she should be. I also don’t think I hooped the fabric tight enough. She is still cute. I decided to try out a few more designs. These are all done using the ST hoop. The duck (Design 17) was the second one I stitched up. I hooped the fabric better and my tension was set correctly. The bunny (Design 13) I used pink threads and purple instead of the blues as I don’t have those colours. He is the biggest image I’ve stitched. I had a few broken threads on this one and had to re-thread the machine a couple of times but I think I’d forgotten to put the spool cap on the thread so that may have been the reason. The lady bug (Design 14) I didn’t have red so she became a pink bug instead. I keep thinking the movie Greece and the ‘Pink Ladies’ The numbers and letters are from the lettering section. I did them in Gothic font on large. These took me a couple of hours to do. Some took as long as nearly 30 mins to stitch up others took only 5. It has given me confidence to play around with my machine. My next step will be to import a design into the machine. I’m wanting to use the embroidery side of the machine more this year to make Christmas gifts. This little challenge gave me a no stress chance to play with the machine without the pressure of I’ve got to get these Christmas gifts done now. I got to see what colour threads I had and what I need to buy. I got to play around with substituting colours on designs. It was a good challenge. What does it do and why do you use it? Until now I’d never used my knee lift. It was just an attachment that I took out of the box when I got the machine that I had no idea what to do with. Asking around I discovered its a lever you attached to your machine that allows you to raise and lower the presser foot with your knee. 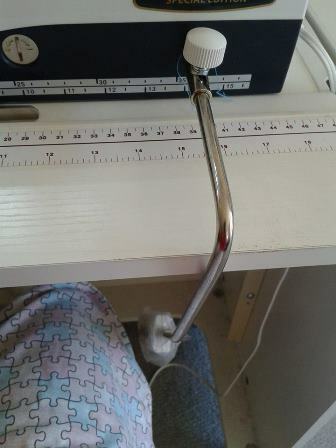 If you do a lot of quilting it becomes your best friend as it gives you an extra hand when your moving the quilt around on the sewing bed, you can keep both hands on the quilt yet adjust the presser foot at the same time. Over the last couple of days I gave it a trial use. Its fantastic. It takes a bit of getting used to and I’ll admit at times I was getting confused between the machine sewing foot pedal and the knee lift. I may have done a couple of odd extra stitches here and there. On one project I was doing a lot of quilting and it made it so much easier just having to move my leg to operate it. Now I know how useful the knee lift is I’ll be using it again. Last weekend I gave free motion embroidery a try for the first time. I really enjoyed doing free motion I know that I will do it again as it was really fun and it transformed the look of the fabric. Next time I will use a different bobbin thread. 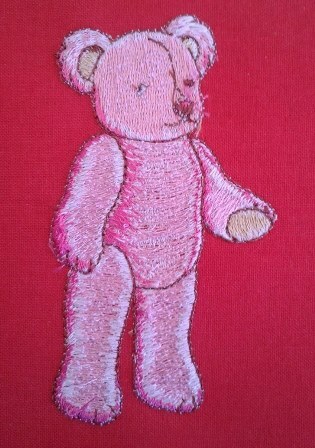 This time I used the same thread I use when doing machine embroidery which is a finer thread. When I pulled out the stabilizer from this some of the bobbin threads pulled so I think for this I need a thicker thread. I got my fancy Janome Memory Craft sewing machine earlier this year. 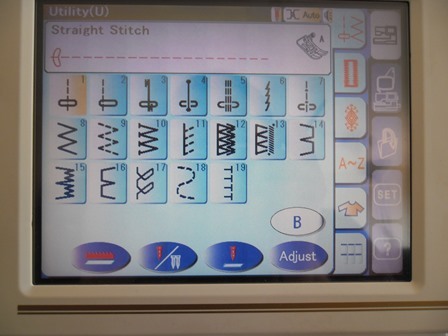 It is an embroidery machine as well as a general sewing machine. Up until now I have only used it as a sewing machine. The embroidery side scared me. I think I have mentioned in previous posts if I’m not familiar with something or unsure of it I get very nervous. Last month I had intentions of trying out the embroidery but life got in the way and I never got to it. Last night I watched the embroidery instructions videos that are on the machine and this morning I bit the bullet and gave it ago. I was clueless as to what I was doing and in fact had to get the tablet pc out next to the machine to even see how to screw the embroidery arm on to the machine. 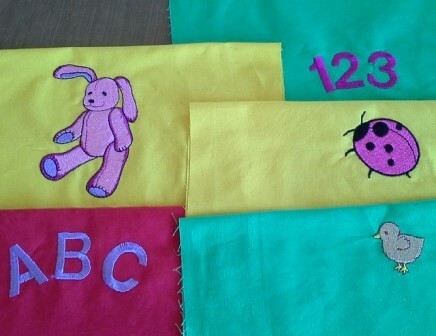 I then had to work out how to even start the embroidery. Of course hit the start button on the machine! Once it started I realised I should’ve cut away the starting thread so I did that I little later than I should have. Oh well learning curve for next time. For a first attempt I’m happy with it. It isn’t as scary as it seems. I’m going to use this as part of a Christmas gift I decided upon last night. 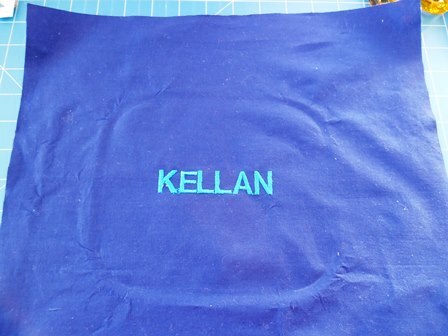 I was going to hand embroider it but I thought no I have this fancy machine I may as well use it to its potential.